Enjoy the weekend, it could be a Cod one. Yes Chesil will be fishable this weekend. I know I am a bit late with the forecast this morning, but I had a late night last night editing some new fishing videos, but I have managed to get out and about this morning and have a look around. It is not exactly going to be the flat calm conditions tomorrow, that were forecast earlier in the week, but to be honest, that is in your favour if you are thinking of coming down to Chesil for Cod and Whiting. Conditions wont be that comfortable, but they won’t be too hard. The wind will be fairly strong but on Sunday it is switching to a northerly, which will flatten out Chesil and make casting a bit easier. In similar conditions yesterday Kevin Webb managed six plump Codling during a morning session. I hope you liked the new articles that we featured this week. Nathan has agreed to do a monthly pike article, which I am sure will excite some of you. I am hoping to get out and do some pike fishing myself this winter. Here is a link to the article for those that didn’t see it Adventures of a River Piker. Leo will also be posting regular features and reports from the Poole area. “I really am hoping you are not going the way of so many other forums and angling sites in filling up your pages with ridiculus adverts…already your pages are getting harder to load and i am losing interest. Try and keep it real. You were doing so well”. Now I am aware that adverts are a bit annoying, however we have to pay the running costs of the site somehow. We make a very small amount from advertising that certainly does not cover the number of hours that myself and Adrian put into the site every week. On average we clock over 30 hours a week, in creating articles, doing reports and administering a site that has tens of thousands of visitors every month. Every minute of video a article takes at least an hour to create. The running costs for hosting alone take up most of the advertising revenue. With this in mind we are currently looking at ways in which we can finance the site, so that not only can we maintain it for the future, but make it much better. I would like you to take some time and fill out the poll below to see which direction we should take for the future. How should the site pay for itself? Chesil Beach: 1.5m waves and lightly coloured water. Portland: 1.5m waves, with lightly coloured water. Chesil Beach forecast:Good tides and some good catch reports indicate that Chesil should fish well this weekend. Cod are on most anglers hit list, but don’t forget that there are some good Whiting to be had as well. Portland: Clearer water around the island will make for some great Wrasse fishing over the next few days. This is one of the months that you are likely to catch a very big Wrasse. ost of the large ones fall to Hermit or hardback crab fished hard on the bottom. Expect high tackle losses, but the result could be a record breaker. The Wrasse record is currently held by Pete Hegg from Portland and is 9lb 2oz. Portland Harbour: I have had a reasonable amount of success with lures for Bass in the harbour recently. I love to use surface lures, as these seem to be the most effective in the shallow waters of the harbour. I would expect to see some nice Flounder from Hamm Beach and Sandsfoot sailing club. Weymouth Bay: Still some Garfish and Pollock from both piers, with more Whiting showing daily. I have heard of very few Squid caught so far. I am hoping to get out for an evening of squiding this weekend. Preston should produce some nice Flounder and Dabs, as well as Bass. I have had several reports of Plaice coming from there as well. Poole: Flounder fishing in Poole harbour is starting to kick off with plenty of fish around the 1lb. mark. There is always lots of school Bass to keep you busy whilst you target the Flounders. We will be reporting a lot more from the Poole area, as a new member will be joining the Fishing Tails team. More will be revealed over the next week. 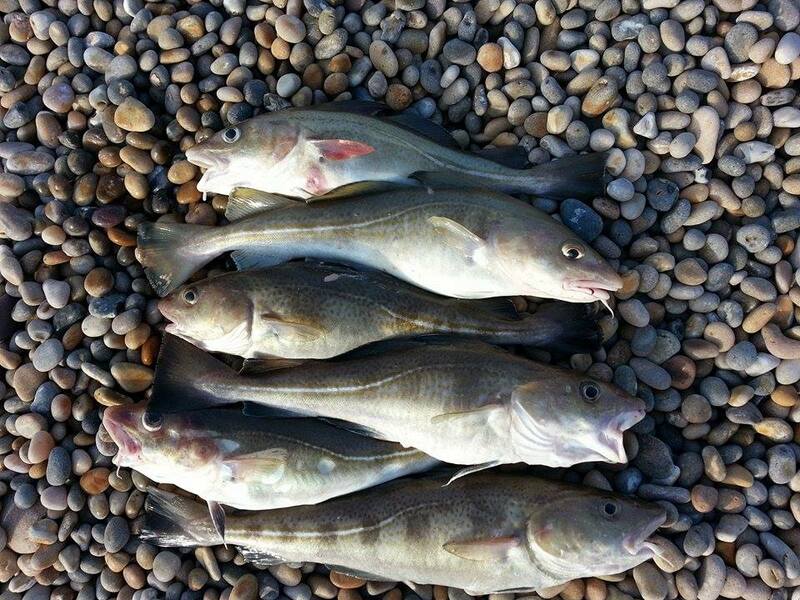 Fishing Tails > All Articles > Reports > Chesil Beach > Enjoy the weekend, it could be a Cod one. One Response to "Enjoy the weekend, it could be a Cod one." Crack on with the ads Sean if it gives you a bit of help keeping such an informative and inspiring website alive. Most people know you can just run an ad blocker if you really are bothered about seeing them.